A photographer attempts to nail down emerging star James Dean for a Life magazine shoot. "James Dean's films haven't aged well, and Dean even comments here on how he feels East of Eden is too over the top. That's not a criticism you can level at Life, a movie so subtle many may find it alienating, but through DeHaan we get to see Dean as the melodramatic cinema of the '50s never allowed us to - an Ordinary Joe." Over the past few years we've seen the emergence of a curious new sub-genre of films in which Ordinary Joes find themselves in the company of a talented but troubled celebrity - Marilyn Monroe in My Week With Marilyn, Dylan Thomas in Set Fire to the Stars and David Foster Wallace in the yet to be released in Europe The End of the Tour. Anton Corbijn's Life is the most interesting entry in this minor movement, possibly because its subject hasn't yet reached his cult status at the time the movie takes place. 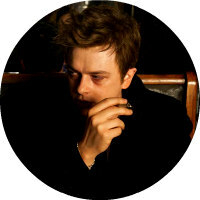 The Ordinary Joe in question here is freelance photographer Dennis Stock (Robert Pattinson). Tired of eking out a living with fluffy PR shoots on the sets of Hollywood productions, Stock aspires to something greater, a photo essay that will make his name, one worthy of Life magazine. Now if only he could find an intriguing subject. It's at what seems another random Hollywood shindig that Stock encounters a fledgling actor, James Dean (Dane DeHaan), a mumbling, slouchy short-arse a million miles from the Burt Lancasters and John Waynes of the world. Stock sees something refreshing in not just Dean's appearance and mannerisms, but his desire to stay out of the Hollywood limelight, and pitches a photo-shoot to Life's photo editor, John G Morris (Joel Edgerton), who is unconvinced but approves the request anyway. Nailing down Dean proves more difficult however. 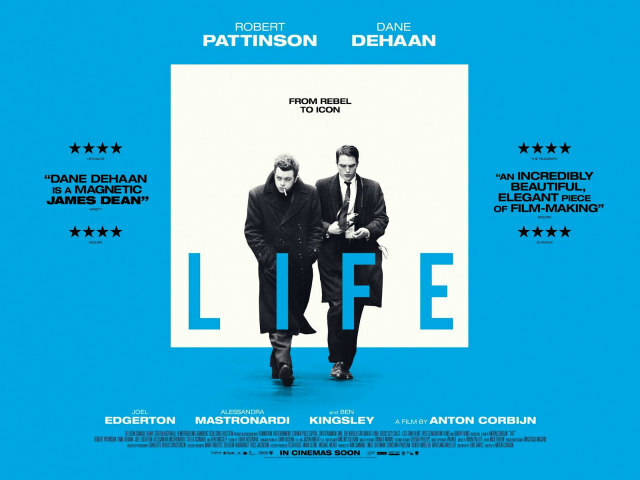 Corbijn and screenwriter Luke Davies never shove it in our face, but there's a fascinating dynamic between Life's protagonists. One, Stock, is in search of fame; the other, Dean, is determined to avoid it. The yin to each other's yang, both men initially jump to the wrong conclusions about each other. Dean views Stock as an uptight New Yorker with his act together. To Stock, Dean is a trainwreck, a social outsider. The truth is Stock's life is a mess, a failed marriage and an estranged son the result of his professional drive. On a trip to Dean's hometown, the actor morphs into the belle of the ball, as socially well adjusted as he could be. While DeHaan was born to essay Dean, it's Pattinson's Stock who is the more interesting character here. He's only slightly older than Dean, but given the nature of the social changes of 1950s America, he may as well be his grandfather, part of a generation that kept their emotions to themselves. Dean however is a product of a post-war reassessment of masculinity, set, along with Brando, Clift and Garfield, to change the idea of a leading man forever. There's a generation now that probably doesn't know who Dean is. 30 years ago, every cheap diner, and some expensive ones, displayed a portrait of Dean (usually Stock's 'Boulevard of Broken Dreams' shot, which we see captured here), but now Dean is as forgotten as Clift and Garfield, while most know Brando as "the fat, crazy guy". Maybe if Dean had lived, he'd have become a similar object of ridicule, or perhaps he'd have faded into TV movie obscurity. His three films haven't aged well, and Dean even comments here on how he feels East of Eden is too over the top. That's not a criticism you can level at Life, a movie so subtle many may find it alienating, but through DeHaan we get to see Dean as the melodramatic cinema of the '50s never allowed us to - an Ordinary Joe.